I have to confess that I know very little about Vietnam in the 1950s. The Quiet American pre-supposes an understanding of such terms as Caodaism, Viet Minh and Hoa-Hoa that I was unable to bring to the novel. It may be the case that, when this book was written, these terms were as intrinsic a part of the popular-news zeitgeist as ‘Taliban’, ‘Social Media’ and ‘Neo-Liberalism’ are today, but what this really shows (aside from my obvious youth and lack of reading), is how much the world has changed since the 1950s and, perhaps, how much this book needs glossing for modern readers. Thomas Fowler is a fifty-year-old English journalist living in Saigon; a war reporter by profession and cynic by nature, he’s engaged in an adulterous relationship with Phuong – a twenty-year-old Vietnamese woman. The novel opens with the reported death of Aldous Pyle, the titular ‘quiet American’; a young and inexperienced envoy to the east who was also Fowler’s love-rival. The story of Pyle’s brief time in Vietnam is then told in flash-back, narrated in the first-person singular by Fowler. Thus the novel is of a strangely cyclical kind – beginning with its own dénouement. 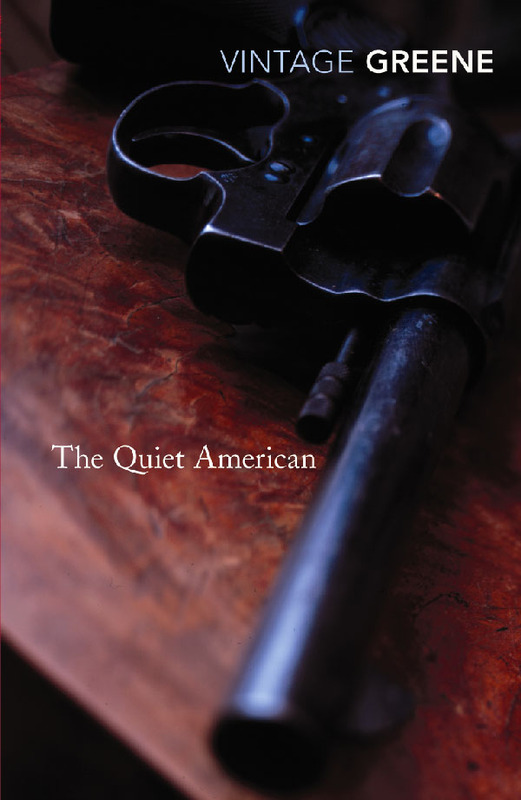 As such The Quiet American is composed of several narrative layers, and superficially functions a mystery novel that slowly unveils the shocking truth behind Pyle’s murder. It can also be read as a commentary piece on contemporary political mores. Crucially, however, the book is a Jungian exploration of the relationship between two very different men. Englishman Fowler is arrogant, adulterous, atheistic and apolitical; American Pyle, by contrast, is idealistic and naïve; well-read but lacking in experience, a man who ‘studies love making’ as he studies orientalism – in books. While Fowler tries (and ultimately fails) to be as politically neutral as possible, Pyle is wide-eyed with democratic idealism, believing that he can help Vietnam to find a ‘Third Way’; a system of self-government separate from both French-colonialism and East-Asian Communism. Unfortunately, Graham Greene is so preoccupied with stressing the dichotic difference between these two protagonists that he fails to develop either of them in a convincing, independent way. Fowler and Pyle become anti-caricatures of each other: Fowler smokes, Pyle doesn’t; Fowler drinks, Pyle abstains; Fowler is an adulterer, Pyle a virgin; Fowler hates dogs, Pyle loves them… It’s tedious and definitely lacking in subtlety. Greene exclusively uses this system of opposites to develop his characters – Pyle and Fowler are only defined against one another and each depends on the other to give meaning to his actions. I don’t want to start a long rant, but The Quiet American offers the epitome of the post-structuralist idea that true meaning is found only in opposition. Conflict is the focal point of this novel – whether political, personal, sexual or narratorial. Dramatic tension is created through the rivalry of Fowler and Pyle as lovers to Phuong – and even in this they are polar opposites. This system of opposition creates an interesting narrative counter-point: Fowler’s identity as a lover to Phuong is only interesting in contrast to Pyle’s, and vice-versa. Ultimately all of their differences come down to one essential conflict – the different ways these two men love the same woman. It’s frustrating that the woman in question, Phuong, is so bland; a weak character who acquiesces to the whims of her lovers with degrading servitude. She is a proxy, a mannequin upon whom Pyle and Fowler project their own ideals of womanhood. Phuong is without an identity of her own – to Fowler she is a sexual distraction and an assurance of company in old age. To Pyle she is an object of idealised, inexperienced femininity: an exotic beauty and poor maiden in need of rescue. While these views may be contradictory, they are nonetheless equally cliché. The ever-willing lover who never tires is just as much a romantic fantasy as the most refined maiden of courtly love literature. Graham Green does his only female character a great disservice – she could have been the true ‘Third Way’ of the novel, if only she’d been constructed more independent, opinionated and idiosyncratically. Instead her only identity is forged from the narratives created for her by her two lovers. If Fowler is England and Pyle is America, then Phuong is a very unconvincing and flacid Vietnam. Stylistically the writing is competent, though I warn you that it is laced with a kind of bigotry that’s most modern readers may find problematic: ‘They don’t love as we do’ Fowler shockingly states of Eastern women. And if you think that opinion would be difficult to sustain in modern times, wait until you get to Greene’s sweeping judgement that ‘white voices sing and black voices gargle’. Quite. In abstraction The Quiet American is a brilliant novel; but novels aren’t written (or read) in abstraction – A love triangle poised on the brink of self-destruction against the backdrop of war time Vietnam sounds like the pre-text for something truly special, but over-wrought characterisation and a penchant for esoteric terminology let this novel down. Greene’s description of character conflict goes too far, and the fact that modern reader’s probably aren’t intimately familiar with the delicate political situation of early 50s Vietnam definitely does the book damage – in this respect, the novel is very much of its time. It left me frustrated and feeling that it could have been so much more, if only it had been…less. This entry was posted in Novels, Reviews and tagged Graham Greene, The Quiet American. Bookmark the permalink. I agree with most of your points but will take issue with the slight gripe that ‘the book hasn’t aged well’ due to the background knowledge needed to access it. The point about familiarity with certain concepts, places and jargon being a challenge to accessibility is something that applies to any piece of writing. For example, if I were to attempt a reading of Tolstoy’s ‘War & Peace’, I would be pretty lost as I know far too little about Russian culture. So to argue that a book seems ‘dated’ because it portrays another time and place seems somewhat overwrought. I too chafe at the flatness of Phuong’s characterisation and bristle at the pervading orientalism that this book is shot through with. Nonetheless, what seems to be a flaw does serve a function. Phuong was never intended to be the ‘Third Way’- her primary purpose was to be the allegorical Vietnam that both the British and Americans sought in turn to possess, but which neither could ever understand (or even sought to do so really). Nice review … but it is a very political book, supporting Greene’s world view of the USA as a blundering innocent trying to do good but committing evil. And before we dismiss out of hand this view, remember the book was written before the Vietnam war. Like much of Greene’s work, where women characters are often never developed, Phuong’s is not revealed but clearly she represents [south?] Vietnam, as Pyle is the US. So the parallels of Phuong’s desire for protection does not need to be spelled out. And unfortunately the outcome predicted by the book is strangely accurate. I agree that Fowler is not a sympathetic character either – certainly flawed – with some unacceptable views. I am not sure if these views are a sign of the age of the book, Greene’s or (as I believe) put on the lips of the character on purpose to offend and highlight widely held views (if hidden) in the West. Greene himself was flawed as we know. Just my opinion as a simple light reader … I am sure I will be corrected!